Malaria parasites bursting from red blood cells. ﻿Scientists have discovered new ways in which the malaria parasite survives in the blood stream of its victims, a discovery that could pave the way to new treatments for the disease. The researchers identified a key protein, called a protein kinase, that if targeted stops the disease. The study is published in Nature Communications. Malaria is caused by a parasite that lives inside an infected mosquito and is transferred into the human through a bite. Once inside the body, parasites use a complex process to enter red blood cells and survive within them. By identifying one of the key proteins needed for the parasite to survive in the red blood cells, the team have prevented the protein from working, thus killing the parasite. 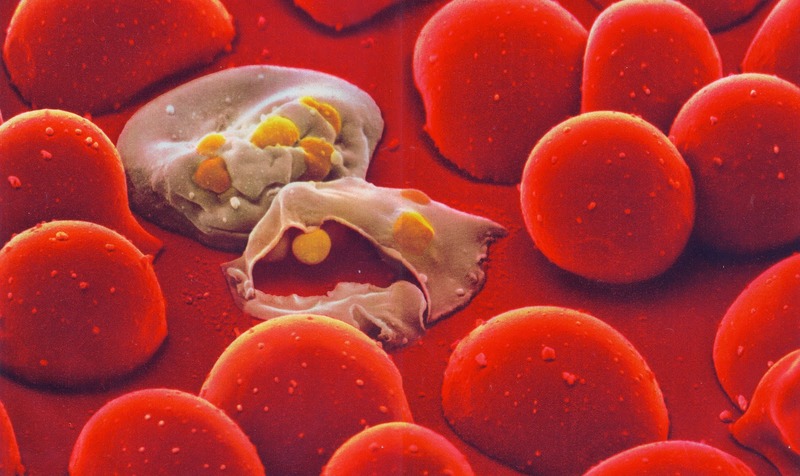 The discovery could be the first step in developing a new drug to treat malaria. The researchers found that one protein kinase, (PfPKG) plays a central role in various pathways that allow the parasite to survive in the blood. Understanding the pathways the parasite uses means that future drugs could be precisely designed to kill the parasite but with limited toxicity, making them safe enough to be used by children and pregnant women. According to the World Health Organization malaria currently infects more than 200 million people world wide and accounts for more than 500,000 deaths per year. Most deaths occur among children living in Africa where a child dies every minute of malaria and the disease accounts for approximately 20% of all childhood deaths. Below is a video about the research. Based on material originally posted by University of Leicester.